Our first stop is at Panteronisia (commonly known as Blue Lagoon) with crystal clear azure waters. At Blue Lagoon you can swim or snorkel and enjoy the beauty of the sea floor. 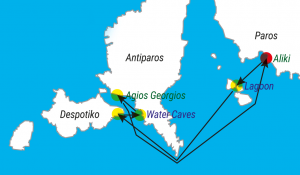 Next we head to Antiparos and the water caves, here you can swim or dive from the rocks. Third stop is Agios Georgios on the south side of Antiparos, where you can have a meal at one of the traditional tavernas. After a good meal we visit the uninhabited island of Despotiko, where recent archaeological finds have been made. The sandy beach of Livadi is the largest and undoubtedly the nicest of the island with its clayey sand. Finally we head back to Aliki and time permitting make another stop at Panteronisia to complete our tour.